Quantum Science and Technology, the discipline focused on the application of quantum mechanics, is expected to play an increasingly significant role in modern science and engineering. The Graduate program of Quantum Science and Technology (QST) was established in 1992 for students graduated from a variety of undergraduate disciplines. 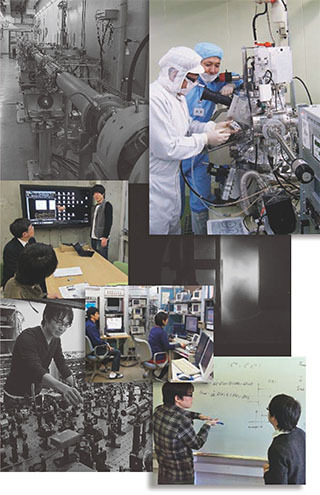 The QST maintains close contact with the Institute of Quantum Science, Nihon University, which has been established to serve as a research center for Nihon University. While the educational program in the QST is conducted in close cooperation with the Department of Physics, this program is open to students graduating from various undergraduate disciplines such as Electrical Engineering, Electronics Engineering, Mechanical Engineering, Mathematics, Information Science, Material Science, Chemistry and Biological Science. Students with various undergraduate backgrounds are admitted and are provided with the special curriculum leading to the advanced level of quantum science. The research fields and curriculum cover a wide range of fields including accelerator science, nuclear fusion and plasma science, superconductivity, condensed matter, quantum optics, information science, highenergy physics, quantum field theories, statistical physics, biological science and computational physics. The Master’s Degree emphasizes the education of basic quantum sciences, the foundation of all modern physics, and their applications to broad areas in science and engineering. With the solid understanding of quantum sciences, graduate students who earn their master’s degrees will be able to contribute to society as researchers and engineers who can adapt themselves to new fields in science and engineering. The Doctoral Degree focuses on the study of more advanced quantum sciences and their applications to science and engineering. Students who earn their doctorate will be able to challenge and initiate new frontiers in various fields in science and engineering.